Last Chance - Limited Quantity - Only 3 left! - The Abyssinian cat is reputed to be descended from the ancient Egyptian cat. The goddess Bast is represented here, a goddess of pleasure and abundance. Pennant measures 16" wide by 20" tall. Rayon batik. Banners have a tube sewn at top for a rod or string to hang them. 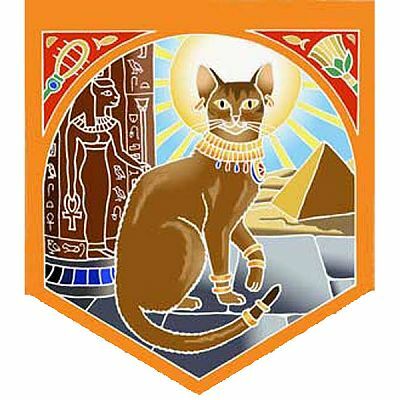 Do you have any other questions about our Bast Pennant?